Our second (hopefully annual) Rotary Charity Céilidh, held on Saturday 10th November at Hathersage Memorial Hall was a true 'win win' event. 77 revellers danced the evening away, responding to a motivating and experienced 'dance caller' leading everyone through tune after tune from the superb Bash Street Band. The dance floor was filled with laughter as everyone whirled around the floor and danced the night away. Evidence that the evening was a success was stamped on smiling faces and the sound of happy chatter, when everyone took a break to catch their breath to enjoy a huge plate of pie, peas and chips. But it wasn't just an evening of fun, fundraising and fellowship; as the £500 proceeds from the event are to be distributed in the main to Helen's Trust, with the reserve being added to our funds to support other local charities. The evening started off at a sedate pace. Time for a rest as Rtn Dave Johnson announces that 'grub's up'. 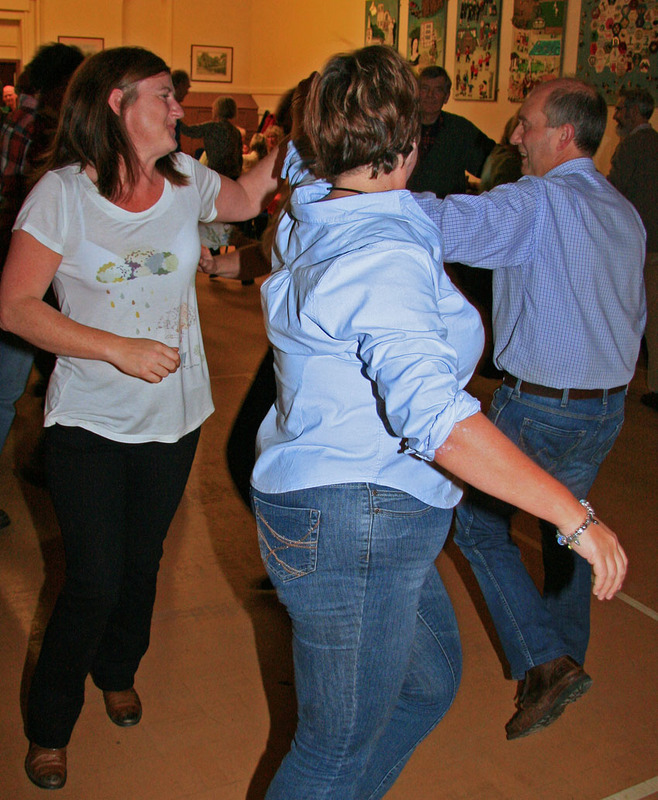 If you missed our barn dance at Hathersage Memorial Hall you have another opportunity to fill an evening with fun, as well as supporting local charities. As by popular demand Valley Rotarians, led by Alisma Clark, are continuing the long tradition of holding our Charity Gilbert & Sullivan Evening at Sickleholme Golf Club at 7.30pm on 16th February. We'll be following the well proven and successful format of a superb formal three course dinner followed by songs and music from Matlock G&S Society.